Emperor Parîkchit journeyed in state over the entire Indian continent, acquainting himself with the administrative excellence of the rule of his grandfathers, with the unique relationship which they had established between themselves and Lord Krishna who had then come down on earth as Man, listening to the experiences of many a saint and scholar who lived in those halcyon days, and reflecting on those cheering memories, as he travelled along. Often he was overcome with remorse at the thought that he was not alive during those days when the grandparents were in such heavenly bliss. He pleaded with the sage to stay a little longer. "Tell me on what mission you have come. Be with me for some more time and assuage the hunger that is gnawing me. I missed the great good fortune that my grandparents had to spend their lives with the Lord Himself. I shall save myself from decline, at least by listening to their exploits and their devotion which drew upon them His grace. Seeing the King who prayed in great earnestness and humility, Vyâsa said, "Son do not feel that you are in any way inferior or less endowed with good fortune. I declare that no one else had such good fortune as you earned. For, you drew upon yourself the grace of the Lord, the moment you were born. The Lord, Vâsudeva, gave you the breath of life; He raised you in His arms and played with you, while you were yet a baby. You too stuck to Him so close that you scarce kept aloof. Your youngest grandfather, Sahadeva, had to pluck you by force from Krishna and hand you over to the women in the inner halls. You were named ceremonially by Vâsudeva Himself. What a memorable scene it was! You showed us that you were a wonderful child; you followed with your eyes the Lord wherever He moved, whichever side He turned. You were intent on "parîksha" (finding out) where He was, as no one else was in that hall that day. Krishna hid Himself very cleverly behind pillars and tried various means of diverting your attention away from Him; but, you proved too clever even for Him! Your eyes were searching for Him alone; they saw only Him and His splendid Form. 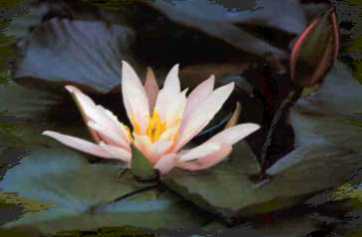 All of us who were then present were wonderstruck at your devotion and concentration. It appeared as if you were examining each face and trying to find out whether it was Krishna's; your face fell when you saw it was not; it blossomed when your eyes saw Him and Him only. Scholars and simple folks, ryots and Rajas, realised that you were a remarkable child. That is the reason why, when your grandfather Dharmaraja prayed to Him to give you an appropriate name. He named you after your strange behavior, Parîkchit (he who examines, he who tries to find out). When the Lord announced this name to Dharmaraja, in the hearing of that vast gathering of courtiers and scholars and sages, they all applauded, saying, "Very apt, excellent, fine". Being so richly favored by fortune it is not meet that you should condemn yourself as unlucky. You were fondled by the Lord; He played with you and watched your gambols; He gave you your name. How few earn this fortune! Do not consider these just common gifts of grace". Tears of joy welled from the eyes of Parîkchit at these words. He had a question rising up from his throat, but, Vyâsa saw him swallowing it and so he patted him on the shoulder and encouraged him to ask it. "Son, it looks as if you desire to put some query to me. Ask without hesitation, do not quail". Taking courage from this prompting, Parîkchit said, "Worthy master! Man cannot know the value of either joy or grief, unless he is aware of them. The joyful contacts of which you spoke now were awarded me when I was scarcely aware of the bliss inherent in them. Real joy can be tasted only when one is conscious of its value. If a child is given a billion-rupee diamond, it will only deal with it as a lump of glass. The happiness of being with the Lord, which you say I had in my childhood, is as ineffective as the joy experienced in past births. I did not know then what precious moments they were. Had I known it, were I capable of knowing it, I could have treasured that joy for ever. Now it is all mere inference. I have no ocular proof of the grace of the Lord which I received then; so, I depend now on auricular proof only. So, please tell me of the greatness and glory of Krishna; let my ears drink the nectar of those stories". Vyâsa was moved by his entreaty; he agreed. "Son, do you consider His lîlâs to be just one or two? How can I relate to you His lîlâs which are beyond one's capacity to enumerate. So, ask about what He did in connection with some particular person, or during some particular incident or situation; I shall gladly tell you all the details". Parîkchit was elated at this; he begged him with folded hands, "Master! Tell me how this great attachment between my grandparents and Lord Krishna was born." Vyâsa burst into laughter. "Son, your earnestness surprises me much. For, only such earnest individuals can get jñâna (knowledge); I am delighted that you have this deep yearning. So, I shall tell you what you have asked for. Listen!" Saying this, Vyâsa made himself comfortable in his seat; Parîkchit, too, got ready to hear, with a heart that was blossoming with joy and ears that widened in the ambition to learn. "Son! King Drupada grew anxious to give his only daughter in marriage to a suitable groom but, could not succeed in securing one, in spite of the most diligent search. So, he announced a Svayamvara (festival for choice of bridegroom) and, kings of great might and majesty assembled in his capital, along with scholars endowed with charming personality, all eager to wed the princess whose beauty was unexcelled in the three worlds. They were all proud of their wealth and valor, for they felt they could win her by those attainments. In that assembly hall, the king had fixed a contrivance on a pillar. It was a wheel revolving fast, a wheel that was reflected in a sheet of water, below the pillar on which it turned. The wheel had a 'fish' tied on it: the competitors for the hand of the princess were asked, one by one, to come forward and, drawing the bow looking at the reflection, shoot at the fish-target up above. 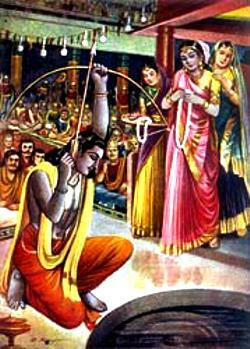 Drupada announced his intention to give away his daughter in marriage to whomsoever hit the target, so prepared. The city was full of princes and kings who had arrived to try their hands at this unique festival of bowmanship. News of this festival reached the ears of your grandparents who had then assumed the role of brahmins, to mislead the wily Kauravas. They felt at first that they should not come out in the open on that occasion; but, Arjuna, your grandfather, was able to persuade his brothers to attend the festival of valor, for, as he said, no kshatriya should stay away when bowmen compete for a worthy prize. Thus it happened that the five brothers sat among the assembly, in the garb of brahmins, like a group of lions, casting a halo of heroism around; all eyes were drawn towards the place where they sat; people commented on their presence, many in admiration, some in derision; some praised them as champions, some laughed at them as prize fighters or cooks. The whispers aroused by them spread all round. Lord Krishna had come for that festival. His eyes were fixed on Arjuna all the time; this was noticed by his brother, Balarâma, who spoke something to his brother. At last, the Svayamvara contest began; one by one, the candidates proceeded to the shadow seen in the water and aimed the arrow at the 'fish' rotating above. They failed and returned pale with humiliation. They walked back to their seats, heavy with disappointment and shame, and sat sunk in sorrow. Krishna had no intention to rise and have a try at the target, for, He sat quiet in His own place. If He had that intention, He could have quite easily hit the 'fish' and win. But, who can gauge the depths of His mind? Just then, Arjuna rose and proceeded towards the 'contrivance', casting a lightning flash of brilliance over the assembly by the heroic aura of his personality. Draupadî, the princess, lifted her head and watched him in admiration. Her mind merged in that flash of light. In an instant, Arjuna's arrow split the 'fish', he won. The applause of the gathering rose to the skies. The princess came forward and wedded him, placing a garland of flowers around his neck and holding his hand. When Arjuna emerged from the Hall holding the hand of the bride, the horde of defeated kings and princes yelled that the rules of the contest were broken, since a brahmin who had no right to compete in bowmanship was allowed to participate and declared the winner. They fell on your grandfather, in an angry clump. But, Bhîma pulled out a huge tree by its roots and whirled it at the crowd of foiled kings.